At Bloomsbury International, we fully understand that the quality and location of accommodation are extremely important factors in making sure your study abroad experience is as enjoyable as possible. In fact, we believe that your choice of accommodation is just as important as your choice of English language school! We offer a wide range of student accommodation options to ensure that you find the ideal place to stay in London to suit your requirements and budget. We will work with you to meet your individual needs, such as a private bathroom or dietary requirements. 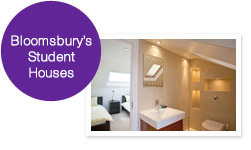 A very popular option is Bloomsbury International's very own accommodation! Our newly renovated student residences are comfortable and spacious with modern facilities. They are located in safe, residential areas with good links to public transport. Living with other students who are studying at Bloomsbury International is a great way to make new friends and practise your English outside of school. 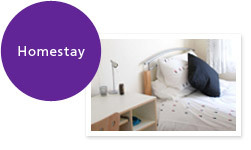 We also offer safe and comfortable accommodation in homestays, external student residences and hotels. To make the right decision, we advise you to check the options carefully and if you need help making your choice, please email our accommodation team who will be glad to answer any questions you may have. Homestay accommodation: the hosts treat the student as a full member of the household, eating together and sharing the common living areas. No more than four students will be accommodated in homestay accommodation at any one time. Residential accommodation: in private homes accommodating more than four students, student houses, halls or hostels, catered or self-catering. Residential accommodation where there is no overnight supervision is not suitable for under 18s. Perfect for students who wish to experience living independently in London, while studying English and meeting other students from around the world. This is an excellent opportunity to learn about life in the UK, experience British culture and practise English at the same time. 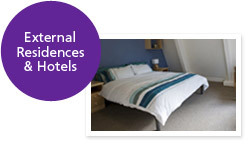 Various types of accommodation are on offer - single, double, twin, triple and family bedrooms.